A team of researchers from the National University of Singapore (NUS) has discovered that the conservation of milky storks (Mycteria cinerea), an endangered wading bird native to Southeast Asia, is threatened due to crossbreeding with their more widespread cousins, the painted storks (Mycteria leucocephala). "Apart from habitat loss and fragmentation, extinction through hybridisation is one of the major threats to endangered species. Our study is the first to provide an estimation of the population genomic status of the endangered milky stork in Singapore, and the findings can contribute to the design of effective solutions for conservation management of the globally endangered species," said research lead Assistant Professor Frank Rheindt, who is from the Department of Biological Sciences at the NUS Faculty of Science. The research, which was conducted in collaboration with Wildlife Reserves Singapore, was earlier published in the journal Biological Conservation. The milky stork is an almost completely white plumaged stork species found in coastal mangroves, mudflats, and estuaries across Southeast Asia. It is currently considered endangered on the International Union for the Conservation of Nature Red List, with about 1,500 individuals left in the wild. About seven to 10 per cent of them are found in the region around Singapore and Johor, Malaysia, and it is believed that the majority of them are related to those which escaped from captivity. Since the late 1980s, milky storks and their sister species, the painted storks, have been held together in captivity in Singapore and Malaysia. Being kept in the same enclosure has led to inadvertent crossbreeding or hybridisation between the two stork species. The painted stork is differentiated from the milky stork by the presence of a black pectoral band and a pink flush in the inner wing coverts and tertials. However, the hybridised storks display intermediacy in these traits. "A few of these hybrids have escaped from captivity. Although some of these hybrid escapees have been recaptured, others continue to roam freely. This poses a major threat to the genomic composition of the milky stork population in the wild. However, the extent of this threat has not been clear," said Miss Pratibha Baveja, the first author of the research paper, who is a Ph.D. student in the research group supervised by Asst Prof Rheindt. To find out how the gene pool of milky storks has been affected, the NUS team utilised population-genomic approaches to analyse the tissue samples of 46 storks from both captive and wild environments of Singapore. Their results showed significant genomic 'contamination' of painted stork alleles in the milky storks' genetic profile following crossbreeding for several generations. Although originating from a limited number of introduced painted storks, these hybrids are now an integral part of both the wild and captive Singaporean and southern peninsular Malaysian stork population. 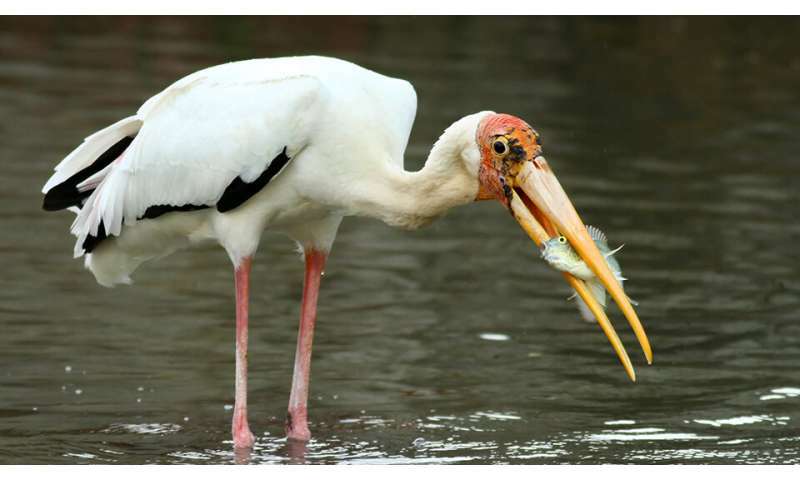 The research team determined that the genomic composition of more than half of the sampled storks is affected by genetic infiltration from the painted stork. These results indicate that due to their very small populations, such globally endangered species may eventually be absorbed into the genome of the more widespread species. "Although native to the greater surroundings of Singapore, the current population of milky storks in Singapore is not only partially hybridised, but also thought to be derived from escaped birds. This has led to a situation in which the species is currently not even officially listed among Singapore's native and introduced bird species. This lack of formal recognition has left the species in limbo, but belies the importance of Singapore for the global survival of the species," explained Asst Prof Rheindt. He added, "The future is likely to see expansions of milky storks from the increasing Singaporean population into the diminishing Sumatran breeding grounds that form the species' core. It will now be up to us here in Singapore to decide whether the core of the range will be re-stocked with pure milky storks or with hybrids. The challenge now lies in convincing the conservation community on the necessity of such conservation actions." To avoid an exacerbation of the problem leading to the use of genetically admixed individuals for conservation breeding or reintroduction, the research team recommends for hybrid storks in bird parks, zoos and the Singaporean wild to be identified and isolated from pure milky storks to prevent crossbreeding. Thorough genetic analysis can be conducted to ensure individuals' purity in any planned breeding programmes or releases. In addition, the team recommends for a strict removal of hybrids from the wild, along with a release of genetically pure milky storks, which are imperative for continued survival of the species.